It's never too early to get a jump on promoting your next book, even if that book isn't written yet. So with that, I'm announcing the impending publication of The Innkeeper's Husband. As much as I'd like to start begging you all to buy a copy, I don't know when it will be published, so you'll have to take a rain check. As you might deduce from the title, the book is about me. 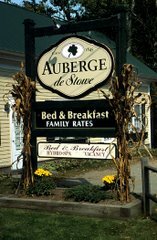 Actually, it's about our experience as innkeepers here in Stowe, Vermont. But it's my point of view, which is that of the great man behind the great woman. Over the years so many crazy things have happened to us, so many unclassifiable events have occurred, that a book like this was inevitable. It actually started with the Stowe Reporter, and the series of columns I wrote for them back in 2001 and 2002, called InnSights. Those articles--about thirty of them--form the backbone of the book's narrative arc. They were a look at the unexpected side of innkeeping, taken from the point of view of struggling new innkeepers. I learned two things from that experience. First, there was a huge market for anything written about innkeeping. And second, it was a kind of writing I enjoyed doing. It was creative non-fiction (heavy emphasis on the creative, light on the non), and I could write from the hip, as it were. My wife Chantal was the one who began encouraging me to write a book from our experiences. Whether that stemmed from her desire to own a Porsche, or a need to diversify my writing portfolio is open to debate. Whatever the case, the book is happening. My goal is to finish it before the end of August. I return to Community College of Vermont for the fall semester, and I'll be teaching two courses then, so time will begin to vanish again. In the meantime, I'll keep you up to date about its progress, and if you know anyone who wants to publish it, give me a call or drop me an email. As a writer, there are sometimes when you just can't write. For some people, that means writer's block. For me, that means Mondays. Mondays are horrific around the inn, and around the schedule. Everything seems to happen on Mondays. The entire day is over-scheduled. The most recent addition to the list is baseball. Both my sons play baseball, and on Mondays one has a practice, the other a game--this week it's out of town. They both have fencing on Mondays, too. This compresses time into diamond status. I'm a coach on one of the teams, so my time is vaporized, too. Today was a great example. After getting home from work about 11:30, I ate lunch, then, noticing the rare patch of blue up in the sky, I decided to mow the lawn. Two acres and an hour and a half later, I transitioned from mowing to electrical repair. I wired the new pool pump to a timer, tested it, then I serviced a gas pump we'll be needing soon to pump out the pool and add new water. By that time it was nearly three, and the boys were on their way home from school. Fed them, dropped one off at fencing, the other at baseball practice, then dropped my book off at the local paper where it will be read and reviewed. So what? you ask. Everybody's busy. True, but something happened with my writing over the weekend. A few days ago I started a journal, and it quickly led to some revelations that ignited a book, long dormant within me. So I'm suddenly taken with the need to write. But then I remembered it was Monday, and my life is not my own. Oh, well. It could be worse. I could have writer's block.